Visitors to this year’s annual public holiday open house at the Connecticut Governor’s Residence were treated not only to seasonal decor but a look at results of The People’s Project – a refurbishment and renovation undertaking. “Nine designers, two months, seventeen different spaces,” noted Carol O’Shea, Executive Director of the Residence. The open house held Friday, Saturday and Sunday, December 3, 4 and 5 was expected to draw between three to four thousand guests to the Georgian Revival-style home, which is just over one hundred years old and located at 990 Prospect Avenue, close to Elizabeth Park in Hartford. Initially privately owned and acquired as the Governor’s Residence in 1943, it is maintained by The Governor’s Residence Conservancy, Inc., a not-for-profit organization of volunteers who plan and supervise preservation and restoration of the home and its gardens. After the Conservancy approached Connecticut Cottages & Gardens for help revitalizing some of the home’s interior spaces, the publication set out in early 2011 to recruit top designers, “all with ties to the Nutmeg State,” as well as,” generous product donations of gold sponsors,” according to a special booklet about the historic endeavor. Success of the project was apparent as visitors toured the main floor tastefully rejuvenated to create a welcoming, yet elegant, atmosphere befitting Connecticut’s first family, Governor Dannel Malloy and First Lady Cathy Malloy, who collaborated on the project by sharing their preferences. 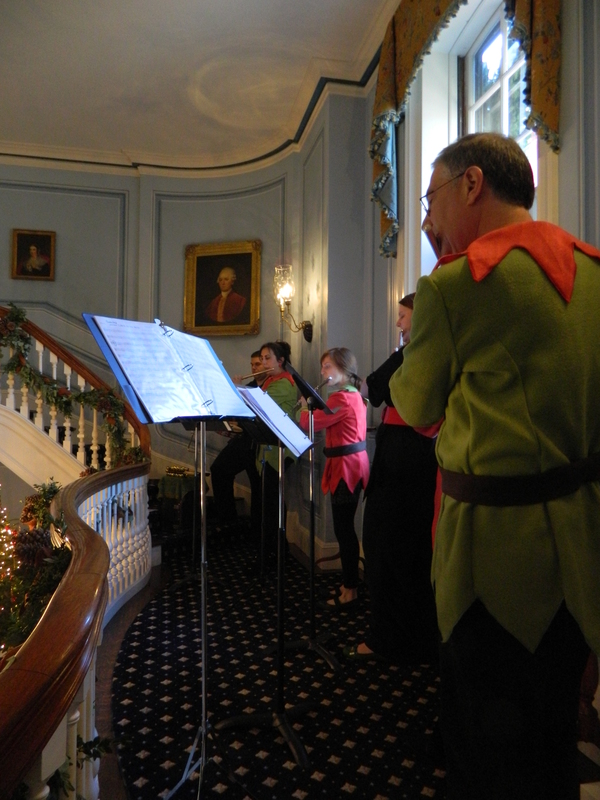 Of course, the fresh design experience was enhanced for visitors by lovely holiday ornamentation and attractions such as instrumental selections performed Saturday by Studio E, a flute ensemble from Moodus. A sense of ease is fashioned by the choice of a platinum color for the reception area adjacent to warm terra cotta used in the library, which features an engaging fireplace with a marble hearth and two paw print doggie beds for Connecticut’s ‘First Dogs,’ next to the desk by a window. The living room has an openness. One of a number of holiday trees was in here, plus a piano, a small statue of state hero Nathan Hale, and the Malloys have out a few framed photos, including one of the governor with former United States Senator Christopher Dodd. Refinement sums up the dining area accented by a long center table, showcasing a quality of sophistication on this day, with settings by Lux, Bond & Green. A tree in this room was adorned with Malloy Family ornaments, many depicting the Jones Family Farm in Shelton, which according to one of the volunteer tour guides, is where all the trees in the Residence came from and where the Malloys get their tree every year. The crowning glory for The People’s Project, arguably, can be found in the sunroom where designer Phillip Gorrivan masterfully blended casual with class. It is in here that the Malloys are said to spend most of their time. Near a fireplace – a large screen television, another holiday tree, a couch and chairs are positioned on one side of the sunroom, that is surrounded by a series of windows each with five vertical rows of miniature panes with a windowed door that opens towards the pool area. On the sunroom’s other side is a loveseat and chair with a coffee table in front close to a green, wooden hutch sporting a beautifully weathered appearance. 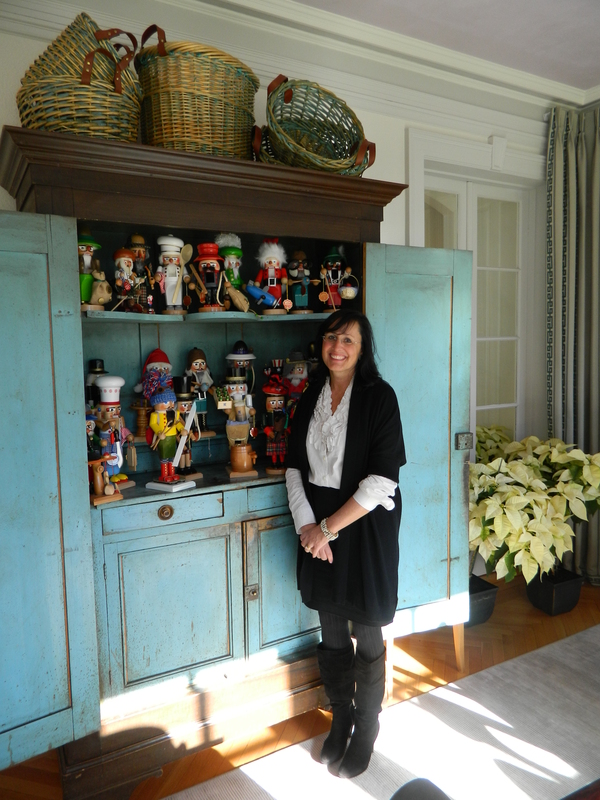 Typically it holds pottery but for Christmas it is the keeper of the Malloy Family collection of nutcrackers. And, on the far end is a light colored wood table. “This is where there was the most dramatic change,” said O’Shea. 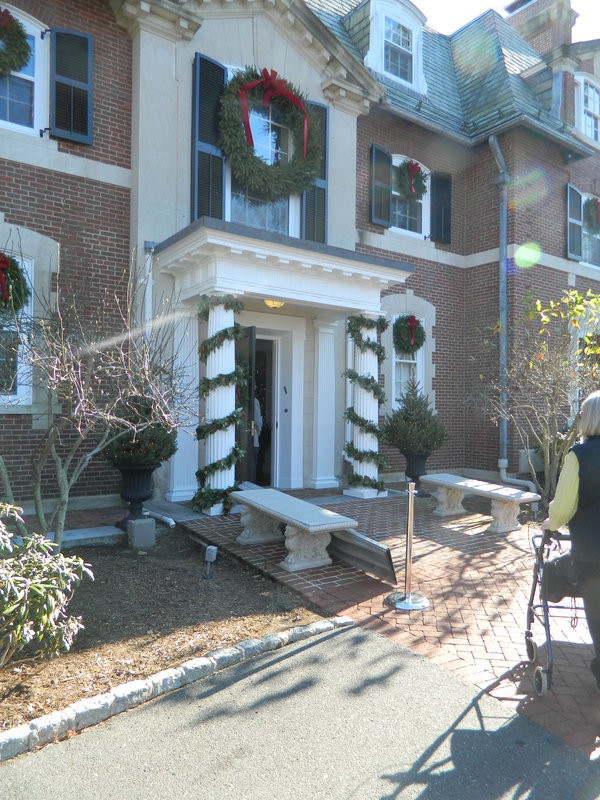 The Residence’s exterior was festively decked with garland and wreaths. 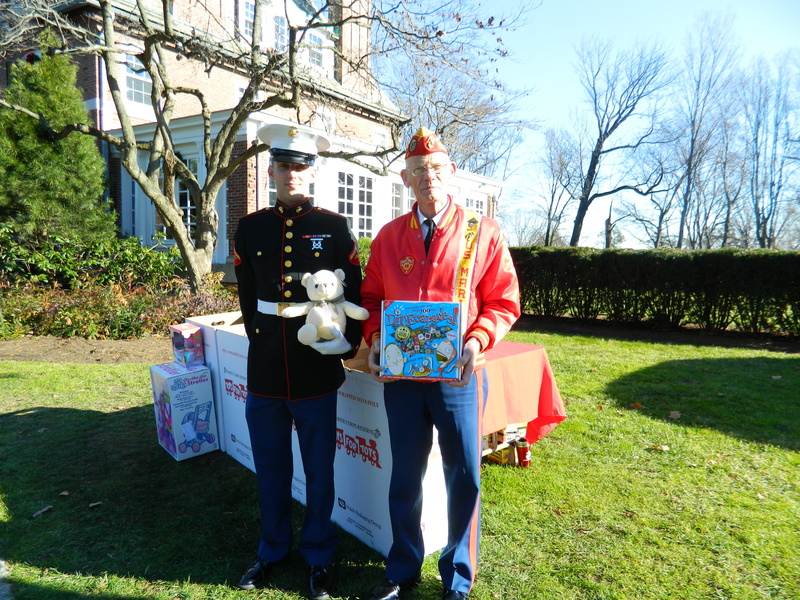 Mindful of the spirit of the season, outside Lcpl Robert Cote and John Clark of the Marine Corp League collected Toys for Tots donations. I attended a Hoiday Open house there a few years back. It is a beautiful home.